We may be a teeny bit biased but we think that Scotland is the purr-fect place for a pet-friendly holiday, with beautiful beaches, lochs, glens and woodland a-plenty for your four-legged friends to explore. Other than enjoying the great outdoors (following the Scottish Outdoor Access Code, of course), what else can you and your pooch get up to during a self-catering stay in Scotland? We asked our holiday home owners and travel bloggers who regularly holiday with their pets to share their favourite pet-friendly attractions and here’s what they suggested (you’ll be paws-itively spoilt for choice – sorry, I’ll stop now!). Take your four-legged friend along on a journey into the past at one of the best preserved jail and courtroom complexes in the world. 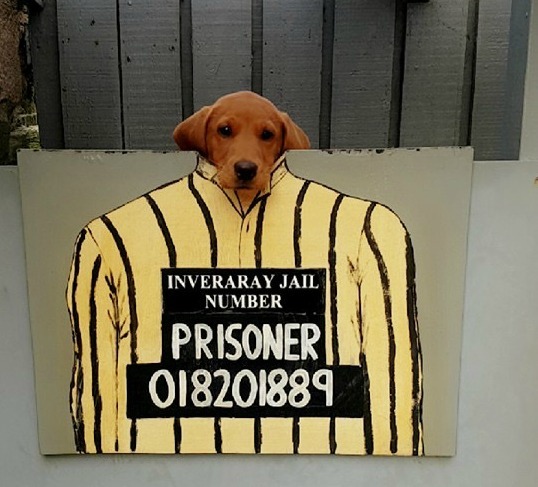 Described by one travel blogger as an excellent dog-friendly attraction, Inveraray Jail shows you what life was life in a 19th century prison for those who were tried and jailed there. The tour includes the gruesome Torture, Death and Damnation exhibition, the Old Prison, the Country Courtroom and the New Prison. Dogs are welcomed free of charge. If brewery touring is right up your street both you and your furry companion will enjoy a visit to Fyne Ales, situated at the head of Loch Fyne in Argyll. Suggested by Fiona Campbell, owner of Mansefield House in Argyll, Fyne Ales has dog beer and dog biscuits for sale, which are made from spent grain after they have brewed with it! So once you’ve toured the brewery and learnt about the beers through a tutored tasting you could relax with a pint of one of your favourites whilst your dog enjoys some doggy beer! Boat trips were a top suggestion from both bloggers and holiday home owners, showing that there are lots of of wonderful dog friendly boat tours in Scotland that you and your four-legged friend can experience. 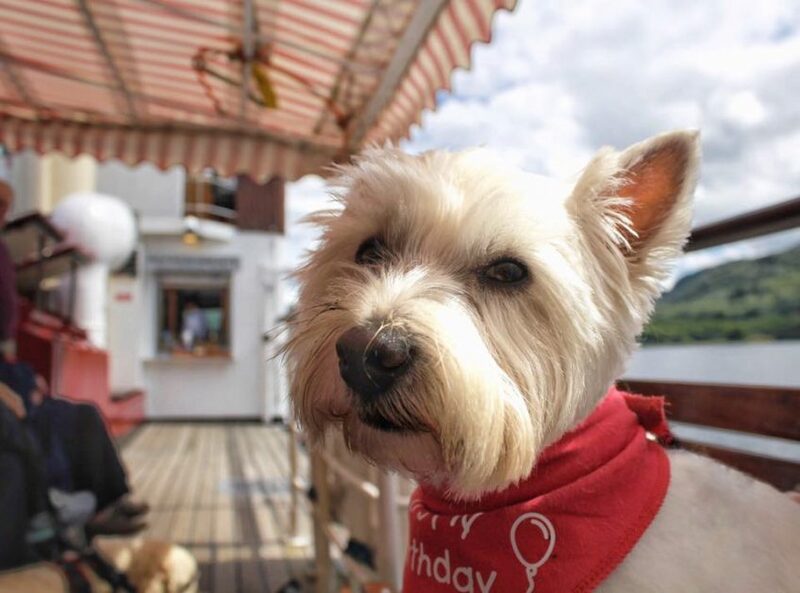 Samantha Grant, blogger at Scotland with the Wee White Dug, recommended a trip aboard the Sir Walter Scott Steamship on Loch Katrine. “Our cruise on the beautiful old steamship was an hour well spent, we all loved it and at £13 an adult and £1 a dug it was great value too”. You can read more about Casper’s trip in this blog post. Casper has also enjoyed a trip to Inchcolm Abbey with the Maid of the Forth. Inchcolm Island is in the care of Historic Scotland and the Abbey, often referred to as the ‘Iona of the East’, dates back to the 12th century. Dogs are welcome on the boat and on the island but must be kept on a lead. Susanne Arbuckle of Adventures Around Scotland also suggested a boat trip in the Firth of Forth as a top pet-friendly attraction. Susanne and pet Willow went on the Forth Bridges Tour with Forth Boat Tours. “We were welcomed on board at the pier in South Queensferry and my four legged companion was suitably fussed over! It is so nice to find attractions that allow dogs and Willow does love a cruise being a frequent ferry traveller herself”. You can read about Susanne’s and Willow’s experience here. 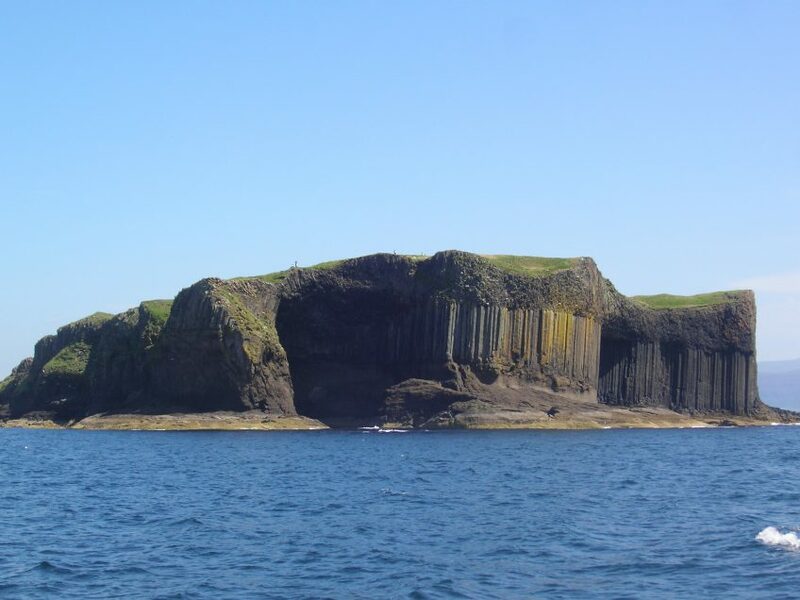 A boat trip to Fingal’s Cave in the Inner Hebrides with Staffa Tours also comes recommended by Sam Grant of Scotland with the Wee White Dug. Fingal’s Cave, on the uninhabited island of Staffa, is an impressive sea cave with basalt columns which is famous for its natural acoustics. Read more about Sam and Casper’s trip to Fingal’s Cave in this blog post. Also running trips to Staffa and the Treshnish Isles, and welcoming well-behaved dogs on their boat trips is Turus Mara, suggested by the owner of Treshnish and Haunn Cottages on the Isle of Mull. Staffa and Lunga are well-known for their puffins, so you can enjoy the sight of these adorable birds and the beauty of this special area without leaving your dog behind. On her travels in Southern Scotland, Susanne of Adventures Around Scotland enjoyed stretching her legs at Castle Kennedy Gardens. There’s more than 75 acres to explore, with woodland and loch-side scenery, and responsible dog owners and all friendly dogs on leads are very welcome. Also in Dumfries and Galloway Susanne gave a big thumbs up to the Mull of Galloway Lighthouse Exhibition where Willow was allowed to join her on a explore around the museum. It costs £3 per person and you can also climb the 115 steps to the top of the lighthouse on certain days for spectacular views. Natalie Ray of Plutonium Sox suggested Loch Leven as a great pet-friendly place to visit, as she enjoyed a swim there with her dogs, Pluto and Bubbles, during a self-catering holiday in Crieff. Natalie wrote about her experience in this blog post. If you’re looking for a photo of your pooch with a Scottish castle as the backdrop you’ll find a number of castle grounds where well-behaved dogs on leads are welcomed, such as Scone Palace in Perthshire. Susanne recommends Culzean Country Park in Ayrshire (one of her favourite Scottish attractions) with its large estate that includes woodland, landscaped gardens and coastline. Read Susanne’s blog post here. Dogs are also welcome close at heel (due to resident wildlife) at Drumlanrig Castle and Country Estate in Dumfries and Galloway where you and your four-legged companion can enjoy the beautiful Victorian gardens and woodland walks. If you have a pet-friendly attraction to add to the list please leave a comment below, we’d love to hear your suggestions! A few years ago we were made very welcome with the dog at the Grampian Transport Museum. Not sure if it’s still the same but was a great day out for dogs and people.